We were first captivated by designer Inke Heiland’s recycled vintage wallpaper kits for gorgeous nursery decor, and we’re equally smitten with her Birdhouse Lamp made by hand in Leiden, the Netherlands from 100% salvaged French Oak. In tandem, her hand cut wallpaper silhouettes and whimsical Birdhouse Lamp create an eco-inspired, serene environment in baby’s bedroom or playroom. 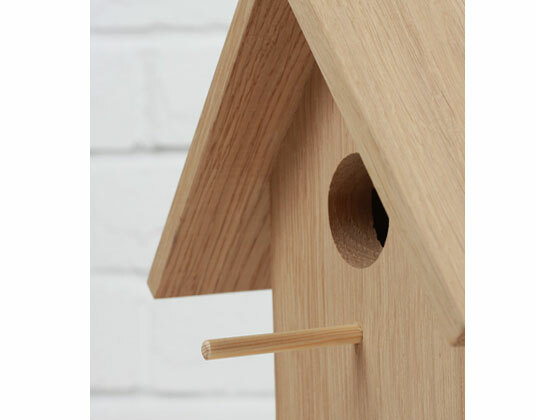 The Birdhouse Lamp comes with an energy saving CFL light bulb and a set of Inke Heiland wallpaper birds. Its frosted acrylic base allows for light to shine through, and a removable back panel enables easy access to the bulb. In addition to her sustainable design efforts, Inke Heiland partners with an organization in the Netherlands that provides disabled adults with meaningful employment. We were first captivated by designer Inke Heiland's recycled vintage wallpaper kits for gorgeous nursery decor, and we're equally smitten with her Birdhouse Lamp made by hand in Leiden, the Netherlands from 100% salvaged French Oak. In tandem, her hand cut wallpaper silhouettes and whimsical Birdhouse Lamp create an eco-inspired, serene environment in baby's bedroom or playroom. The Birdhouse Lamp comes with an energy saving CFL light bulb and a set of Inke Heiland wallpaper birds. Its frosted acrylic base allows for light to shine through, and a removable back panel enables easy access to the bulb. In addition to her sustainable design efforts, Inke Heiland partners with an organization in the Netherlands that provides disabled adults with meaningful employment.